Why do we continue to use the “Droop quota” and in the process disenfranchise a significant percentage of voters? In the past the adoption of the Droop quota allowed us to reach a conclusion in the count without having to distribute preferences to the Nth degree and count every vote. However with the use of computer based technology this justification no longer applies. By calculating the quota to be “x(/y+1)-1”, as defined by Droop, we are ignoring up to a quota of voters which results in a large percentage of votes being locked up in what is referred to as the “wasted quota”. 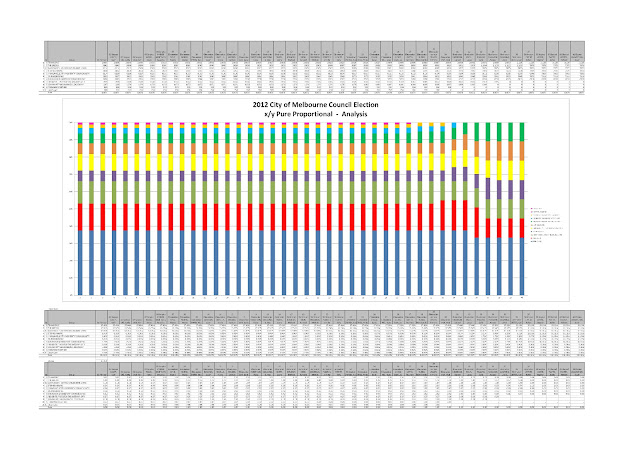 The effect of the Droop quota can be seen clearly by analyzing the 2012 City of Melbourne Council vote. In this case Team Doyle received around 38% of the vote and elected 3 positions with 8% of voters (Team Doyle’s surplus) was ignored. If the system was a pure proportional count the quota would have been 11.11% instead of 10% and the outcome of the election would have been more representative. Under the Droop quota the Greens managed to elect 2 positions with just 14% of the primary vote and community candidate Kevin Chamberlin on 6% miss out being elected. If the count was pure proportional without the distortion of the Droop quota Kevin Chamberlin would have been elected with the support of Team Doyle’s surplus preferences. Why should Team Doyle’s voters be disenfranchised and ignored by being lockup in the discarded quota, why should not the system be fully proportional and each vote of equal value. The current system using the Droop Quota at best can only be described as semi proportional. The system using the Droop quota becomes even more distorted under the Victorian Local Government count-back rules as the vote that has been left on the table is not taken into account when calculating who or which candidate fills the casual vacancy. The Victorian State Parliament Electoral Matters Committee to date has not scheduled a review of the Local Government elections, it is unclear if they will even though it is within their terms of references and they have an obligation to do so. The Victorian Electoral Commission (VEC)’s Tally for the City of Melbourne shows votes have gone missing. In spite the City of Melbourne’s Returning Officer. Bill Lang. claiming that the data provided to scrutineers was a complete copy of the below the line votes there are votes missing or added into the count that were not disclosed or included in the information provided to scrutineers. Under the Local Government Legislation the VEC is required to reconcile the number of votes recorded in the computer database prior to running the execute button. When requested to provide a copy of the reconciliation report the Returning Officer failed to do so. We wonder why the secrecy? In 2006 the VEC stuffed up the Legislative Council Northern Metro and Western Metro counts by entering in the wrong data into the computer, No attempt was made to reconcile the number of ballots recorded on the computer records with the number of ballots received. It is this sought of sloppy administration and cutting corners that continues to bring the VEC into disrepute. It is made worst when they seek to cover it up and deny information to scrutineers. Bill Lang said at the scrutineer/candidate’s meeting that “the scrutiny of the ballot is not important”. Something we strongly disagree with. The scrutiny of the ballot is just as, if not more, important than the counting of the votes. Without scrutineers and access to the data there is no way of knowing if the results of the election are correct and that the votes have not been tampered with or that the data-entry is in fact a true record. Anyone viewing this information can tell from looking at the above that ballot papers have gone missing or not accounted for. There is a discrepancy between the Lord Mayors Ballot (649996) and the Council Ballot (65071) of 75 votes – Presumably they were envelopes that had one ballot paper in them and not the other. The number of missing ballot papers is greater as not all envelopes that have ballot papers missing would have had Council ballots in them and not the Leadership ballot, Some would have been the other way around. What is a greater concern is that the number of envelopes reported as being received by the VEC on the Friday was 66432 some 1361 less Council Ballots and 1436 less Leadership ballots. Where did these ballots go? They could have been ballot papers that were rejected, did not have a signature or no ballot papers were inside the returned envelope. We just do not know, the VEC failed to provided a reconciliation report as required prior to running the count program. There are a number of possible errors and faults that can occur with a computer count. The wrong data can be transcribed and entered into the computers database, as we saw in Western and Northern Metro seats during the 2006 State Election. Votes could be removed from the count or even double counted. Normally ballots are presorted, prior to counting, into primary votes. This allows scrutineers to obtain an early primary figure which in turn is then used as a control/check digit to determine if any votes have been left out or mis-recorded. The Victorian Local Government Act (Sch 3 cl 11B) requires that votes be sorted into parcels based on the primary vote. The VEC sought to cut corners by skipping this very important step in the process of counting the vote and in doing so prevented scrutineers from being able to properly monitor the data-entry and counting process. They were left blind, bamboozled by the claims that the use of computers in the counting of votes was accurate, But as we know this is not true – like that of a Magic Trick the audience can be readily deceived and distracted. For the sack of saving $300 to $400 to have staff presort the Council below the line ballot papers into primary votes the VEC undermined and prevented the proper scrutiny of the ballot. The presorting of ballot papers could have been undertaken in parallel with the opening of and the sorting of ballot papers into above-the-line and below-the-line votes. There were only 5500 below-the-line votes – not an onerous task by any stretch.. The conduct of the election count was made worst by the VEC refusing to provide final copies of the computer data-file at the conclusion of the count. Scrutineers were again denied access to crucial information. Review of the count sheet shows that the results of the election were within 350 votes which could have changed the election outcome. A wrong figure punched into the computer a 7285 instead of 7825 is all that it would take to produce a different result and no one would know. The VEC’s administrative processes are not good, they certainly do not meet the high professional standard that is employed by the Australian Electoral Commission. There is no independent oversight or review. The VEC has not been vetted or certified to meet ISO 2000 quality control standards. It is an organisation that is left wanting with little desire. The VEC spent over $35 Million Dollars developing software (Most of which was outsourced to India). It is still unclear who owns the intellectual property rights for the VEC’s election software? What we do know is that design of software that developed does not meet current IT industry standards. The Australian Electoral Commission (AEC) is by far the better and more professional body. Given that the AEC already has in place computer systems and administrative procedures used to conduct elections we have to wonder what is it that Victorian Taxpayers get for their investment. Why do we have two public electoral authorities with duplicated resources when we could have just one professional organisation. It is up to our parliamentarians (The Electoral matters Committee) to sort this mess out. They have to act to restore confidence and integrity, put an end to excessive waste, secrecy and incompetence that engulf the Victorian Electoral Commission. The first step would be to subject the VEC to independent review by the office of the State Ombudsman and Auditor General. Melbourne’s electoral system is seriously flawed an in need of urgent review. The system in place provides an unfair disadvantage to unaligned independent candidates and the method of calculating the surplus transfer value and distribution of preferences is tainted and not accurate. Mr van der Craats, who is running as an unaligned candidate said “that the above-the-line voting system should be scrapped and the method of counting the votes revised to address the anomalies in the system that make the system unfair“. Voters who wish to support independent candidates or those that are not included on group tickets have to vote below-the-line. Above-the-line voters in most cases do not know where their votes or preferences are allocated or aware of the impact they have on the outcome of the election. A team or party vote locks in voters preferences which are then allocated according to the groups ticket. As a team vote is able to be directed this provides an unfair advantage in the preference deals that decide the election. Un-grouped candidates are placed at the bottom of the ballot paper and denied the same rights as ticket votes in that voters have to vote below-the-line to cast a first preference vote for them. Most candidates running on group tickets have little to no chance of being elected and are only listed to bolster the groups appearance or to direct preferences to support other candidates. A lead candidate on a team ticket can be elected with less than half a quota (>5% of the total vote) where an un-grouped independent candidate would require 9% or more below-the-line primary votes. Melbourne’s Council election is already decided as a result of predetermined preference deals. It is a question of magnitude and only 11 candidates are placed to have a chance of being elected. Victoria’s voting system is additionally flawed by the way in which the vote is counted. The system of “proportional representation”and the method of calculating the surplus transfer value (The number of votes that a candidate receives that is over the 10% quota) is not proportional. Ticket/Party votes are inflated in value at the expense of minor parties and independent candidates. The system used is, at best, semi-proportional and is not accurate. Add to this technical issues related to the distribution of preferences from excluded candidates where votes are segmented and distributed in such a manner that they do not apply equally to all votes. The principle that a a vote for an excluded candidate should be distributed in order of the voters preference as if the excluded candidate had not stood does not apply to Local Government elections. Votes skip candidates and are allocated to other candidates at a higher value than they would otherwise be had they been distributed according to the order of preference indicated by the voter. The system in use is akin to dealing from the bottom of the deck and giving higher value to some votes at the expense of others. These distortions in the way we count the vote came about as a result of trying to ease the manual counting of votes. With the use of computer-based technology there is no justification or need to maintain the flaws in the way our votes are counted. If we calculated financial dividends the way Victoria calculates the vote our financial system would collapse overnight with a loss of confidence. In addition: The method of filling causal vacancies by count-back is also flawed in that the system does not include votes that retain a value and are left unused on the table. In the City of Melbourne count-back that was held last year over 6000 unallocated votes were ignored and voters disenfranchised. The wrong candidate was elected to fill the casual vacancy. Successive Labor and Liberal Government’s have failed to review the system in place and address these issues. The Victorian Parliament’s “Electoral Matters Committee” has responsibility and oversight of Victoria’s local government electoral system. whilst they have reviewed the State election they have not reviewed the system as it applies to Local Government. The CHAIR — Are you appearing in a private capacity or representing an organisation? If so, which organisation? Mr van der CRAATS — I am a member of the Proportional Representation Society of Australia and of the Australian Labor Party, but the evidence that I give is of personal opinion. The CHAIR — I ask you to begin your verbal submission, and we will take it from there. Mr van der CRAATS — Thank you for the opportunity to speak to this Parliament. I do so with some reluctance, mainly because the last time I gave evidence to this committee I was subjected to what I consider to be harassment, intimidation and vilification by the chief electoral commissioner. It is a matter that I raised before with this committee, or the previous committee, and it failed to respond or to properly act. It is my belief that the actions taken by the chief electoral commissioner constitute contempt of Parliament, and I would like that this committee give further consideration to the complaints that I forwarded to the committee on previous occasions with the view of having the matter properly dealt with by an appropriate authority. I will raise this later in my submission, particularly with respect to item 4 and in relation to the role of the Ombudsman and the electoral commission as it is the Ombudsman that I believe is the appropriate body to review such complaints. However, this committee has a responsibility to ensure the integrity of the parliamentary process, that the committee process is intact and that witnesses are not subjected to some form of harassment or intimidation as a result of evidence given that may be detrimental to or critical of the conduct of the election’s process. Having said those points of view, I wish to raise a number of issues, in particular in respect of the scrutiny of the ballot and the method of counting optional, preferential and other matters. My main concern at this stage is the scrutiny of the ballot and the way in which the Victorian Legislative Council election is counted. Scrutineers were denied access to the data entry data file as and when the data was being entered into the computer. This meant that the scrutineers had no means of properly validating the integrity of the data file. The information was only provided at the conclusion of the count and, as a result, it had to be taken at face value. There is no justification or rationale as to why that information could not have been progressively published as the data was being recorded. In fact to have done so would have ensured that the process was open and transparent and that the scrutineers had a chance to monitor the data as it proceeded. It would have also ensured that the data had not been tampered with or altered as the election count progressed because people would have had copies and they could have gone back to see if any changes had occurred. I think this is an important issue, and it is a fundamental one that the committee must address in respect of the drafting of regulations. It has become quite clear and apparent that the Victorian Electoral Commission is incapable, unwilling or does not desire to ensure that this process is open and transparent. This is a matter about which I have had some disagreement and conflict with the Victorian Electoral Commission going back nearly 20 years to when we first involved ourselves in the data entry computerised counting system. I think there is a trend towards computerised counting of elections, and I think that should be welcomed, but it should not be at the expense of openness and transparency. Obviously those candidates who win an election have no need to complain, but those candidates who feel that the system may not have properly fulfilled their requirements or that it was not as open and transparent as it should have been would be perceived as sore losers if they persisted in putting forward their complaints. I watched with great interest the conduct of the 2006 state election. I think many of the members of this Parliament are aware of the errors and the problems related to the way in which that was conducted and counted. There are still a number of unanswered questions in respect of the 2006 election which have not been properly addressed. However, in reflecting on the 2010 election, there were some improvements. The data file that was eventually provided provided the information pertaining to the preliminary and secondary count. This was useful information and allowed some form of comparisons to the data quality of the data entry that was recorded. It was noted quite significantly that data quality in the 2010 election was significantly better than the data quality that occurred in the 2006 election. However, it was marred by the fact that the Victorian Electoral Commission failed to provide copies of that data file as it was progressively being built up. It was requested. A number of scrutineers I know from the Labor Party requested the Victorian Electoral Commission provide access to that data. They were refused this information. That, in my view, denied them the right to properly scrutinise the election. It is probably incumbent on the Parliament to look closer at the roles and obligations of the scrutineer and what their role specifically is in terms of where and when they cannot interact with the counting process to oversee it. At the moment it is fairly well left open to the goodwill of the electoral commission to interpret what they consider to be fair or not fair. Unfortunately I do not believe the Victorian Electoral Commission has acted necessarily in good faith, and I do not believe that it has implemented procedures that ensure that the process is open and transparent. The publication of the data file progressively as the count progresses goes a long way to meeting that requirement and my concerns. The next issue I wish to raise, which I have tried raising on previous occasions, is related to the method of counting that is under the legislation of the Electoral Act. There are a number of deficiencies and errors, in my view, in the way in which the election is counted. These deficiencies and errors came about as a result of a manual counting system. Under the manual counting system there were a number of shortcuts that were introduced into the way in which the count was made, and these were done to facilitate the speed, effort and manageability of a manual count. At the time they were considered to be a fair and reasonable compromise to make. However, with the advent and the use of computer technology we need to really review the methodology that we use to count the vote. There is no need to take these shortcuts. In fact the number of shortcuts that we have implemented really distort the outcome of the election process. I think that is fairly evident when you analysed the Queensland 2007 Senate election. In that particular instance the segmentation of the vote, the way in which excluded candidates’ preferences were redistributed resulted in, in my view, the wrong candidate being elected to the last position on the Queensland Senate. In analysis of the vote that took place in 2007, if you took the last remaining seven candidates in the count and you redistributed the entire ballot paper according to only those seven candidates standing, the Greens candidate, Larissa Waters, should have been elected. This is an error of process due primarily to the shortcuts and segmentation that we implemented to try make it easy to do a manual count. They are no longer required under a data entry process. I urge the committee to seriously consider the counting rules to make sure that they are a little more accurate and a little more representative of the voter’s intention. I have outlined those under the system which we have referred to as the ‘Wright’ system. Effectively it is a reiterative counting system that every time there is an exclusion you start the count again as though that candidate had never stood. It effectively mirrors the similar process that takes place in a single-member electorate, which I am sure you are all familiar with. The other issue I wish to raise is optional preferential voting. The first time it was introduced was in 2010. In my view optional preferential voting is misleading in terms of the voter. The way in which the electoral commission sold and promoted optional preferential voting was that it in fact encouraged voters to put 1 to 5 only on the ballot paper. This disadvantaged and disenfranchised many voters. Those people who may have favoured a particular group or segment of the community stopped at the end of their 5 votes, and the result is that those who remained in the count had a greater say as to the outcome of that election. I think optional preferential voting needs to be seriously looked at. Personally I do not agree with that. I think you are wasting your vote by exhausting your vote, particularly after no. 5. The aim, if your vote is not counted, is that you should have the opportunity to choose an alternative candidate. I think it is incumbent on the electoral commission to encourage voters to maximise their vote, not to cut it short, not to make it simpler for their data entry process. I think it would be more appropriate and more accurate if the Victorian Electoral Commission stated quite clearly that people should vote or indicate a preference for every candidate, and not just stop at 5. That is an issue I again urge the committee to look at. In respect of the silent enrolment entitlement, I registered to vote on the day before the election day when I submitted my documentation at the polling place, which included a silent enrolment form. Unfortunately my documentation was lost and, as I understand it, my vote was not counted. I think this boils down to some concerns over the administrative processes that are embarked upon by the Victorian Electoral Commission. I believe that everybody has a right to nominate whether they wish to be on a silent enrolment or not. This would be best facilitated if there was just a tick-box on the application form. Anyone who wanted to enrolled to vote could decide whether or not they want their names listed. It is simpler, more straightforward, and it is certainly more cost effective. Other issues and concerns relate to the overall duplication that is involved in maintaining a state electoral authority. What we are seeing in across-borders Australia is something like $35 million being spent on duplication of resources. We are seeing vast amounts of money being spent on development of software. It is software which is being duplicated in each state, each territory and each jurisdiction. There should be a lot more coordination and liaison going on. I also believe it would be probably more efficient if we had a centralised Australian Electoral Commission where the states had some input through the form of a board of directors or something like that. A single electoral authority can act professionally, with integrity and certainly have the cost benefits that would come with having a single organisation. Vast amounts of money have been spent on the electoral process, and we could save hundreds of millions of dollars by restructuring and reorganising the way in which the states’ electoral processes are delivered. Point 4 is an issue of great concern to me. Currently under the Ombudsman Act the Victorian Electoral Commission is excluded from the Ombudsman reviewing it. This has implications with respect to freedom of information. It has implications with respect to people who have complaints about the administrative processes that are embarked upon by the Victorian Electoral Commission. The position of Ombudsman is in place to allow various administrative complaints to be considered outside the political arena. It is difficult, I understand, and this is the problem I think the previous committee had, to address issues that may be perceived to be of a political nature, particularly when dealing with the umpire — that is, the Victorian Electoral Commission. Having reviewed and considered the role of the Ombudsman, particularly in view of the number of complaints I have had in respect to the Victorian electoral commissioner, I believe the Ombudsman is the appropriate person that people should have the right to go to to have these issues properly investigated. I do not see any justification for prohibiting the Ombudsman from reviewing the role of the Victorian electoral commissioner on administrative matters. The Ombudsman has the role of reviewing the Victorian police commissioner, and I think he should have the same role of reviewing the Victorian electoral commission. My final point of concern is in respect to the 2008 municipal elections. Again this was a failure of the previous committee. It failed to review or provide an opportunity for people to have some input into a review of the municipal elections. There are a number of commonalities that exist between the state and municipal elections but many of them have not been properly addressed. The disclosure of the data entry file as an election progresses is one of them. Municipal elections also have another aspect to them that state elections do not have, and that is the countback system. 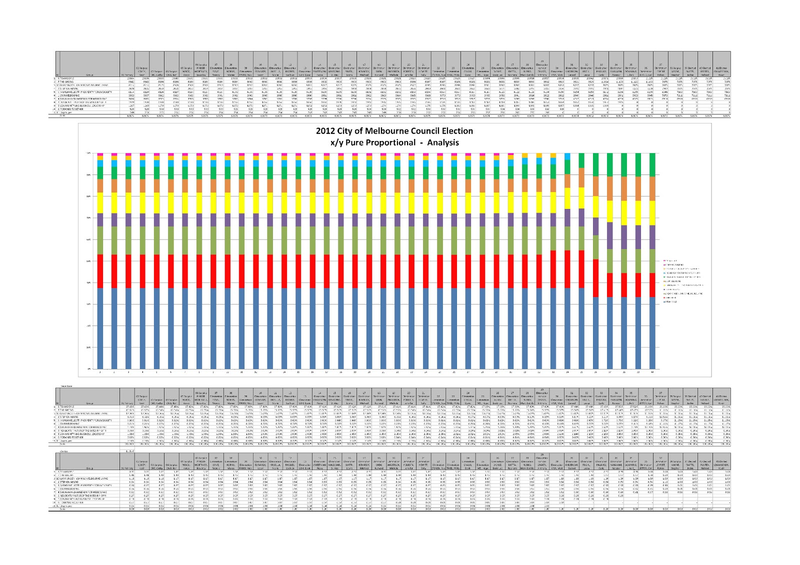 In reviewing the countback system for the City of Melbourne election which recently occurred as a result of Peter Clarke’s resignation, I became aware of a number of deficiencies in the technicalities of the way in which the countback process has been undertaken. Rather than take that up in detail — because I have not canvassed that particular issue in my submission — I would urge this committee as a matter of urgency prior to the 2012 municipal elections to undertake a review of the 2008 elections and see what comes out of that review. The CHAIR — Thank you very much. Any questions? Mr van der CRAATS — Count A and count B.
Ms RYALL — Yes. What indicated to you that there was a difference? Mr van der CRAATS — You can do a comparison between the first data and the second data, a direct comparison, and you can get an idea of where the preferences may have changed as a result of data entry error. In the 2006 election the Victorian Electoral Commission refused to provide copies of the preliminary data entry, therefore it was impossible to make a comparison with the final data entry, so I had no idea where the changes occurred. Ms RYALL — So when you suggested that there were data quality differences, that was an assumption. Is that correct? Mr van der CRAATS — No, the records differ. You can see a very clear difference in the record data set itself, the preferences that are written there. For example, in some cases a preference might have been recorded as a ‘050’, or it may have been a ‘50’, or it may have been a ‘5’. I do not know how the systems interpret it; we did not have access to that information. The number of areas that we did identify in the 2010 election were not significant, certainly not enough to warrant a change or closer scrutiny of the vote itself. The time that would be required, obviously, to do that would not be justified by any benefit it would produce. In the 2006 election that was not necessarily the case, particularly in Western Metropolitan Region. Not having access to that preliminary data and the secondary data, I think, was a major deficiency. The Victorian Electoral Commission at the time claimed that the preliminary data had been destroyed or overwritten. I find that extraordinary and very difficult to believe. As a systems IT person I would certainly have backup processes in place. If I have got data files that are worth hundreds of thousands or millions of dollars to collate, I would certainly have backup copies of that information. Had we been able to do a cross-examination of the preliminary data and the secondary data, we would have realised where the changes occurred. All I can go off is what was published by the Victorian Electoral Commission, and in 2006 there was a discrepancy of 250 of the total number of votes recorded between count A and count B went missing. I can understand that mistakes occur, but I would like to know where those mistakes did occur, and the information published by the electoral commission did not make that clear. It concerns me greatly because in 2006 the change of the result between the first count and the second count was something like — you would remember this very clearly — 150 votes. I do not know where they went, and I am a very fastidious person when it comes to looking at data. Ms RYALL — Thank you. Just one more question. You spoke of shortcuts. Can you give examples of those shortcuts? Mr van der CRAATS — When you have got a group of ballot papers and you are excluding a candidate and some candidates are already elected, you skip past those candidates and you deliver the ballot paper to the next available candidate at a higher value. In a proper analysis of the way in which the count should be taken, those votes actually should be contributed to the candidate who was originally elected, or previously elected, to form part of their quota and therefore part of their surplus. That is a shortcut that we took. We said, ‘They’re already elected; we’ll skip them and we’ll dump the vote directly at a lower candidate on the preference pile’. This has the effect of upping the value of that vote — it is no longer equal to the other votes which have contributed to the previous person’s election. That is one shortcut. Another shortcut occurs in the way in which we distribute surpluses. We do similar things, we skip candidates. We end up delivering votes in that process. It gets down to the segmentation. If we are distributing the votes, we stop at the point when we have distributed one particular pile of votes. For example, if a candidate has been excluded, they may have six different segmented vote piles: primary votes, secondary primary votes and subsidiary surplus. We distribute them each separately, and that can have a dramatic impact in terms of calculating the transfer value that takes place. This is all related of course to the upper house. These are shortcuts that facilitate a manual count. In a computerised count we can take the time quite readily because we are talking about 3 hours as opposed to 20 minutes to count an election using a computerised algorithm. Do you understand? Ms RYALL — Thank you. The CHAIR — There being no further questions, thank you very much, Mr van der Craats, for your time today and your contribution. A copy of the transcript will be coming your way in about a fortnight. Any typos that you discover in that transcript may be corrected but not matters of substance. Mr van der CRAATS — Thank you.